What?? A blogging award? Me? Cool! 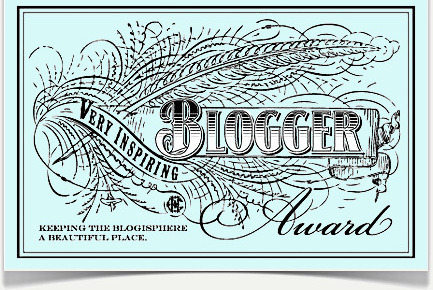 Charlotte of My Crazy, New York, Post-Grad Life nominated me for The Very Inspiring Blogger Award! I’m flabbergasted and uberly excited! I’m not sure why I waited so long to get into the blogosphere – there are so many hilarious people I can relate to. It’s kind of awesome. 1. Display the Award Certificate on your website – done! 2. Announce your win with a post and link to whoever presented you with the award – done! See above. 3. Present 15 awards to deserving bloggers – Listed below. Going to let them know! 4. Drop them a comment to tip them off after you have linked them in the post – next to do! I’m afraid of birds and other things that fly such as grasshoppers, bats, dragonflies, etc. I can be an excessive and obsessive organizer. I like cooking even though I rarely do it. I hadn’t had red velvet cake until I was about 33 years old. Horrible shame. I think pregnancy is gross, no offense to anyone. I love books about prison, the Holocaust and slavery. I get annoyed by stupidity easily. Ok, all requirement done or nearly done! Thanks again Charlotte! I can be an obsessive organizer too haha. Thank you for the nomination. I really appreciate it! You’re very welcome Tia! I knew there would be more organizers online, it’s nice to connect!